The Honda Goldwing has been manufactured for roughly 40 years. Over 600,00 have been sold mostly in the United States. A very popular model, but challenging to mount your GPS, smartphone, or whatever gadget you have to your bike. Earlier versions had a handlebar. Handlebar mounts are by far the most popular location to mount gadgets. I would say roughly 95% of all motorcycle mounts sold are indeed the handlebar variety. Paired with a custom cradle, a handlebar mount can accommodate practically any device imaginable. We have even seen motorcycle drink mounts. While we aren’t fans of the practice, riders can enjoy their morning cup of coffee while riding. Personally, I put that up there with texting in terms of safety. Just another thing to divert your attention from the road. Roughly 20 years Honda’s design change removed the majority of real estate away from the handlebar. While it looks better, it diminished the ability to mount your stuff. Mounts in other places are needed. I have read many a post and spoken to several Honda Goldwing riders that have used adhesive or bungee cords. There are for sure certain adhesives that will hold quite tightly and not compromise from the vibrations of a motorcycle, but there are also many adhesives that will fail. Unless you are a chemist or manufacturer specializing in adhesives and know it will withstand extreme vibrations, we don’t recommend using them on motorcycles. The issue with a bungee is that they wrap around the device and block part of the display. I suppose that doesn’t matter greatly for an Apple iPod, but if it’s a GPS, that isn’t going to work well. Fortunately there are a few companies that figured out some good locations for mount points on a Honda Goldwing. The clutch/brake reservoir is an excellent location. The bolts can be used to hold mounting solutions specifically designed to fit a Honda Goldwing (turns out most Harley Davidson models have similar dimensions so most of what we talk about applies there as well). 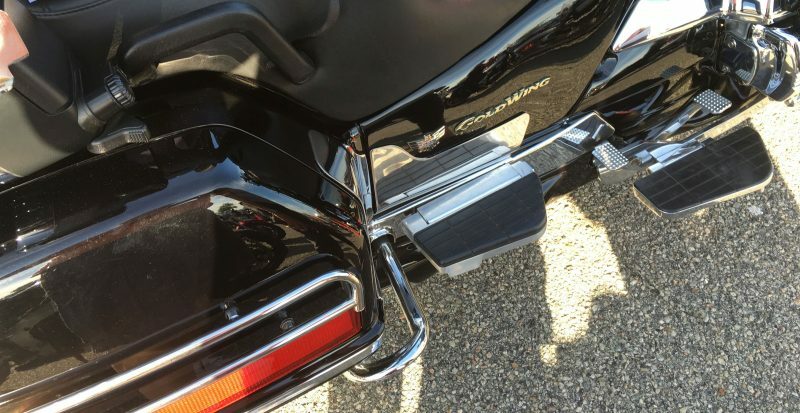 We are familiar with two proven companies that manufacture mounts to fit the Honda Goldwing. Techmount, based in the United States, manufactures a well made metal solution that features a 17mm ball. Ironically (or maybe not ironically) that’s the same size ball that Garmin uses for the back of their GPS cradles. The Techmount Techmount Harley-Davidson and Metric Control Mount Kit with Techgripper gives you everything needed to mount a phone or almost any GPS. This part comes with stainless steel bolts that will replace the current Honda Goldwing clutch bolts. These bolts are somewhat similar to the manufacturer set with the exception they are longer to accommodate the added depth of the mount. You can add your Garmin Nuvi or Drive cradle to the mount or use the included Techgripper expandable cradle. The cradle expands to 4 inches to hold most GPS and almost any cell phone very securely. RAM Mounts, also based in the United States, has an extensive array of mounts that fit the brake/clutch reservoir. All made of metal, most mounts will feature the RAM Clutch and Handlebar Mounting Base mounting base. This part is somewhat similar to the Techmount entry in that it will attach using some newly supplied bolts that take the place of the manufacturer set. The one inch ball at the end of the mount will then connect to various arm sizes and lastly a custom or universal cradle. The clutch mounting base can also be purchased as part of a kit that includes an arm and adapter. Consider the Ram Mount Double Ball Brake/Clutch Reservoir Mount for clutch attachment. There are a variety of custom configurations that can be purchased from RAM and this article would be become a book if we went through all of them. Suffice it to say though, if you purchase a kit that starts with the designation RAM-B-174, you will have the beginnings of the mount that is made to fit your Honda Goldwing.